What might seem like a trivial task to most hobbyists, removing and replacing (or reinstalling) a distributor can easily degenerate into a time-consuming, frustrating job that can result in great difficulty in getting an engine running properly. Although most "shade tree mechanics" know the function of a distributor, many forget that its operation must be perfectly phased with that of the camshaft. A person might go to great lengths to mark the position of the distributor on the engine block and then completely overlook the position of the rotor shaft, or vice-versa. This mistake is so easy to do that even "seasoned" professionals constantly make it, ending up with an engine that won't start or is so far advanced or retarded in timing that it barely runs. The following is presented to show you how to avoid mistakes and gain a little confidence in the process, whether you are replacing the distributor in an old engine or reassembling a new one. Remember at all times that both valves on the "master" cylinder (usually #1 cylinder) must be closed, meaning the piston is at Top Dead Center. Before doing anything with the distributor, crank the engine to Top Dead Center, so that the timing mark on the crank pulley is at the TDC or 0 mark on the timing reference. This is easier said than done, however, since the crankshaft turns at twice the speed of the camshaft. Therefore, not only do you need to line up the timing marks, but you have to make sure the piston in #1 cylinder is at the top of its compression stroke. Tip: Engines are usually dirty up front, so when you find the timing marks paint them with a little correction fluid (White-Out, Liquid Paper, etc.). They stand out beautifully under the timing light's pulses. So how do you do this without exposing the valves? Carefully, very carefully. Of course, if the engine has been running perfectly before removal of the distributor, just crank the engine until the rotor lines up with the position on the distributor cap where #1 spark plug wire is located. However, if your engine is running poorly — or not at all — you can't make the assumption that the distributor is correctly positioned. The best way to know you are at TDC is to look at the valves, so if you're planning on replacing valve cover gaskets go ahead and take the cover off. If you aren't inclined to do so you might try a small mirror (dental mirrors work well) that can be inserted in the oil fill hole in the valve cover. If you're lucky - and the hole is close to the #1 valves - you will be able to observe the valves as you crank the engine. If none of the above is practical, take out the spark plug on #1 cylinder and put your finger tightly in the hole. Slowly crank the engine, using a remote switch or someone else using the key, but just a little "tick" at a time. You are feeling for a vacuum or pressure. Here's where it gets a little tricky. If you feel pressure the piston is either coming up from the bottom of the intake stroke or coming up from the bottom of the power stroke. Since you don't know which, you are looking for vacuum. When you feel vacuum, the piston is pulling in mixture to compress, and therefore the next pressure you feel is that of the compression stroke. Keep ticking the starter until the timing marks line up and you will almost certainly be at TDC unless you've made some gross error of judgment. Worst case scenario: If you can't be sure of TDC no matter how hard you try, just crank the engine to the timing marks and install the distributor as below. You stand a 50% chance of it being right. If the engine won't start or backfires through the carburetor, install the distributor 180 degrees from where it is and you'll be in the ball park. Assuming you are replacing the distributor, take out the hold-down clamp that keeps it in place. Some of these are hard to see, but locate it and remove the clamp and hardware. There's no reason to mark the old distributor since it won't be going back in. Now compare the new (or rebuilt) distributor with the old one. Are they identical? Are the total shaft lengths equal? Do both have the same number of gear teeth? If not, you need to make sure the new distributor will fit, even though it might not look exactly the same. Next, does the new one have a vacuum advance mechanism or do you have to use your old one? If you need the old one make sure it's working by sucking on the vacuum fitting. Setting the point gap. Note the points' wiper is on the tip of the distributor cam. Stop now and set the point gap! While the distributor is out and easy to work around, put it on the bench or in a vise and set the point gap to the correct specification. This will make getting the car running much, much easier. We will still put a dwell meter on it once it's running, but this will get us going. 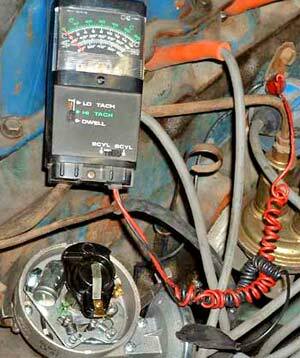 Mark the body of the new distributor at the point where the rotor will be next to #1 cylinder's spark plug wire. Once that is done, place the distributor into the engine hole and gently lower it until the shaft engages the camshaft gear. Since the two gears mesh in a rotational manner, you need to guess where to position the rotor's shaft as you lower the distributor so that it will rotate into the correct position when the unit is in place. Also, most shafts connect at the bottom to the oil pump drive, and you might find your rotor won't engage it properly and still rotate to the right position. If you need to rotate the oil pump drive shaft, you can usually do so with a screwdriver (for slotted types) or a 1/4 inch long socket (for hex types). You'll need to experiment with the amount of rotation until everything matches up, so don't get impatient. This is no time to say "close enough." Once the new distributor is in, replace the hold-down clamp and snug up the attaching hardware, leaving just enough play to allow rotation of the distributor for timing. With the distributor in place and the rotor pointing to #1, put on the cap and plug wires, taking time to place each one according to firing order. Don't assume they are correct unless the engine has been running fine previously (but if it was, why are you replacing the distributor?) 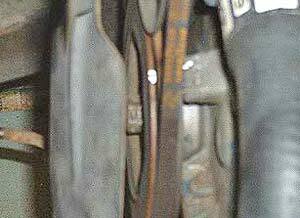 Leave off the vacuum advance hose, but plug it up to avoid vacuum leaks while running. Double-check everything and remove loose tools from the engine air cleaner (yeah, we put them there too!). Dwell meter hookup - Always connect to points side of coil and ground, and don't forget to set the meter for proper number of cylinders. Start the engine. It should run, although not perfectly, since it is set to fire at TDC. Put a dwell meter on the coil connections and measure for proper range. If it needs to be adjusted, do so now before setting timing. Remember, two degrees of dwell equals one degree of timing. Okay, now hook up the timing light and get it pointed to the timing marks. Rotate the distributor to get the correct advance setting, then turn off the engine and tighten the hold-down clamp. Replace the vacuum advance hose. Now get the engine running again and note any misses or firing problems. Assuming there are none, now you can adjust engine idle mixture and speeds on the carburetor. 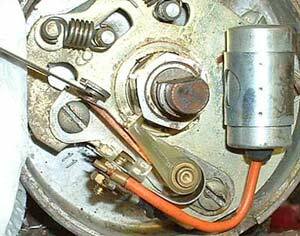 If you adjusted the carburetor before doing the ignition work it will most likely be off. Never adjust anything until the ignition is correctly set up. Otherwise you will be "chasing the problem" and never catch it.